This page documents the tornadoes and tornado outbreaks of 1987, primarily in the United States. Most tornadoes form in the U.S., although some events may take place internationally. Tornado statistics for older years like this often appear significantly lower than modern years due to fewer reports or confirmed tornadoes. The Tornado "Season" of 1987 was one with a fairly slow spring, followed by a much more active late spring/summer. Two particularly devastating tornadoes of 1987 were the Saragosa, Texas tornado of May 22 and the Edmonton, Alberta tornado of July 31. The fall and early winter could best be described as "average" in terms of tornado activity, with a significant outbreak on November 14 and 15, and a killer F3 in December. Confirmed tornado total for the entire year 1987 in the United States. There were 6 tornadoes confirmed in the US in January. There were 19 tornadoes confirmed in the US in February. A F4 tornado in Mississippi and killed six people, a tornado touched down near Moselle and grew to a width of 2 miles (3.2 km) as it passed near Laurel. The tornado traveled a distance of 40 miles (64 km) killing six people, injuring 350 others, and causing $28.5 million in damages. There were 38 tornadoes confirmed in the US in March. There were 20 tornadoes confirmed in the US in April. There were 126 tornadoes confirmed in the US in May. On the evening of May 22, a short-lived but powerful F4 tornado struck the City of Saragosa killing 30 people and injuring over 100. Many were killed attending a graduation ceremony for pre-school children at the Catholic Hall of Our Lady of Guadalupe Church. Eighty percent of the residential area was reported as destroyed. On June 5 a tornado occured in Idaho, caused 3 injuries, the highest number of tornado related injuries for the state. A tornado hit by Białystok, a largest city in northeastern Poland, and destroyed 100 homes. An F2 tornado hit Casper, Wyoming and caused $250,000 in damage, making it the most destructive tornado to hit Casper. There were 163 tornadoes confirmed in the US in July. A rare high-altitude tornado struck Wyoming, uprooting over one million trees along its 24-mile path. The tornado was rated F4, and is among the most violent high-altitude tornadoes ever recorded. In Edmonton, Alberta, Canada an F4 tornado remained on the ground for an hour, cutting a swath of destruction 30.8 kilometres (19.1 mi) long and up to a 1,300 metres (0.81 mi) wide in places. The tornado killed 27 people, injured more than 300 people. There were 63 tornadoes confirmed in the US in August. There were 19 tornadoes confirmed in the US in September. There was 1 tornado confirmed in the US in October. There were 55 tornadoes confirmed in the US in November. The 1987 Arklatex tornado outbreak was an outbreak of 50 tornadoes (four rated as high as F3) resulting in eleven fatalities, ten of which were in Texas. There were 14 tornadoes confirmed in the US in December. The West Memphis Arkansas tornado from December 14, 1987 was an F3 rated tornado that resulted in 6 fatalities and 100 injuries. ^ "U.S. 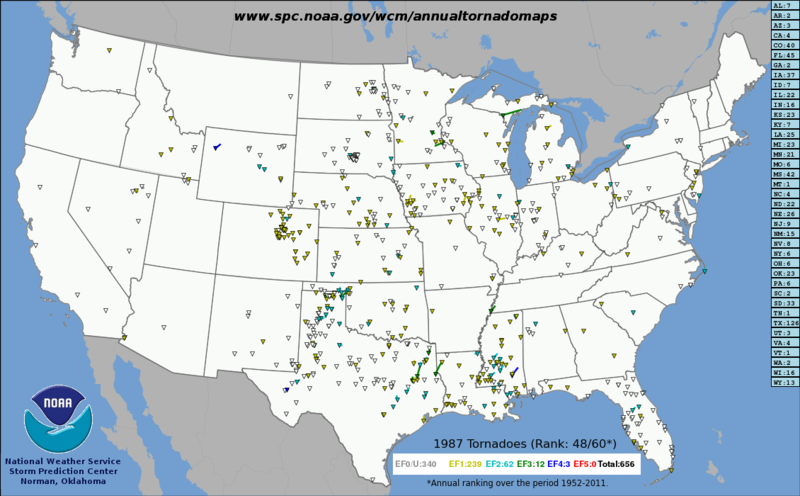 Annual Tornado Maps (1952 - 2011): 1987 Tornadoes". Storm Prediction Center. National Oceanic and Atmospheric Administration. Retrieved May 16, 2015. ^ "Tornadoes in 1987". Tornado History Project. Retrieved May 16, 2015. This page was last edited on 17 April 2019, at 06:54 (UTC).